In the great American pizza wars, there are generally two superpowers still standing when the smoke clears - on the eastern front, we have New York City with its legendary fold-and-funnel slices, replete with oozing cheese and bits of vegetable and meat shrapnel (and of course, their oft-confiscated secret weapon, the New York municipal water supply). Dominating the middle of the country, we have Chicago with its heavy artillery - the dense and copious deep-dish pie with sides so high you need ladders to lead an assault on it. During the multiple decades of the quest for pizza superiority, Boston has quietly been churning out quality discs of dough while remaining somewhat under the national radar, in part due to the fact that there isn't really a style of pizza Boston can call its own. To write off Boston as a non-combatant would be a tragic mistake, as with some light reconnoitering one can find some pizza joints and bistros that serve up pies worthy of their European heritage. As with any force to be reckoned with we'll start with the heroes of old whose pizza trays may show the tarnish of age yet still throw a respectable pie, and then work our way to Boston's young upstarts. Any list of superlative pizzerias in Boston will undoubtedly feature the two places synonymous with pizza in The Hub - Santarpio's and Regina Pizzeria. 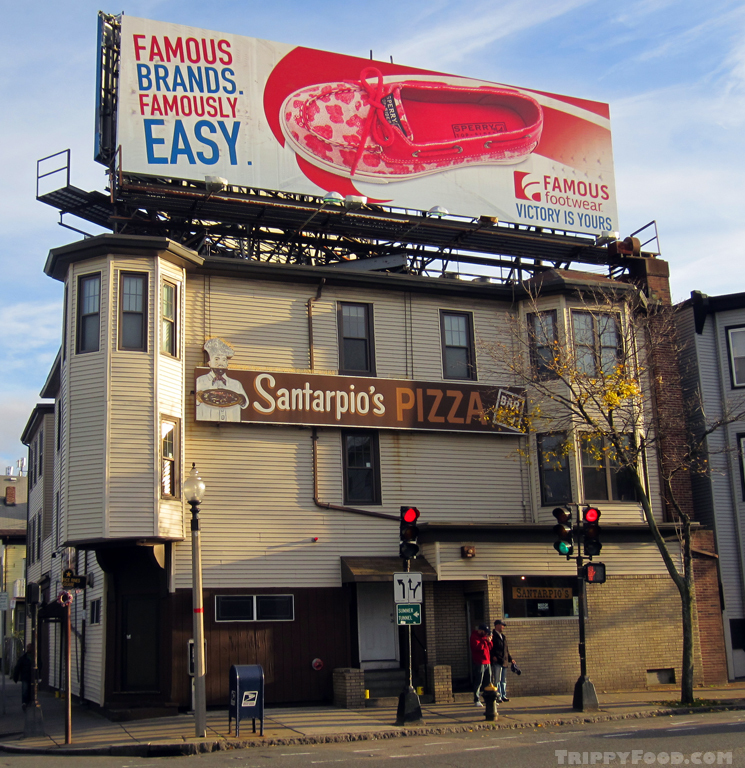 Santarpio's is the patriarch of pizza plutocracy, starting as a humble yet popular Italian bakery in East Boston back in 1903. 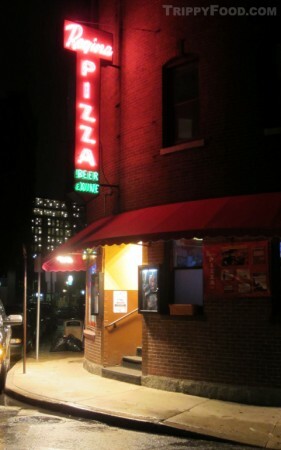 After enjoying moderate success on the ground floor of a massive triple-decker wooden apartment house, Joseph Santarpio transformed the business into a restaurant dubbed Santarpio's Cafe, although it wasn't until the 1960s when Joseph's son Frank reinvented the restaurant as Santarpio's Pizza that they became a landmark institution. Their huge hand-painted sign features a faded pizza chef who looks to be suffering from a major case of vitiligo and beckons motorists en route to Logan Airport from the elevated Route 1A. The decor is simple with a smattering of old, signed black and whites from heavyweight boxers who graced the joint with their presence over the years; at the far right of the bar is an open pit of glowing coals where lamb skewers, house-made sausages and steak tips are grilled (the only other menu items besides the pizza). Skip the formality and belly up to the bar - there's no maître d' and your tab is cash only; please don't insult the staff by using a knife and fork. Most of those who work at Santarpio's are family, having literally been working there forever and if you're lucky you can catch a glimpse of the huge Ferris wheel pizza oven in the back that makes short work of supplying the hungry masses with pies, or witness meat being skewered in the back room for the grill. If you're looking for duck confit, black truffle or chanterelle mushroom toppings, you've undoubtedly come to the wrong place. Ask at the bar and they'll tell you that their most popular pie is the Italian cheese, sausage and garlic pie; this savory gem gets a wash of thick red sauce with a liberal dose of shredded mozzarella, crumbly sausage, chopped garlic and fistfuls of grated parmesan. The dough is firm enough to resist wilting from the sauce, and the cheese bubbles up in a rich, brown mountainous landscape; the crust has some spring to it without being too doughy or disintegrating under your teeth. It becomes apparent after the first slice why Santarpio's has taken home Boston Magazine's Best of Boston Award no fewer than nine times and made Alan Richman's list of the country's top 25 pizzerias in the May 2009 issue of GQ magazine. The pizzeria that has come to be the yardstick against what most Boston-area pizzerias are measured has to be octogenarian Regina Pizzeria (or Regina's, as the locals prefer). Literally on a corner of an impossibly narrow North End street, the Polcari family began serving their Neapolitan-style pizza to Boston's famous Italian neighborhood back in 1926 with a small fleet of pizza ovens ready to supply the teeming masses that often form an hour-long line stretching out the door. Over the years, the Polcaris have built a dynasty that features several Polcari's Italian restaurants and Reginas in just about every mall in Massachusetts, but mamma mia, for the love of God, if you want to sample their pizza the way it was meant to be eaten you need to brave scarce, expensive parking to dine under the flickering neon glow of the original location (pilgrims to Pizzeria Uno on East Ohio Street in Chicago that have made the unfortunate foray into an Uno Chicago Grill will explain the importance of dining at the flagship). As with Santarpio's, the focus is on traditional toppings (you won't be able to commit the CPK sin of ham and pineapple, even on the gourmet pizzas), but advantage Regina's is that you can order by the slice - can't decide between pepperoni, cheese or sausage? 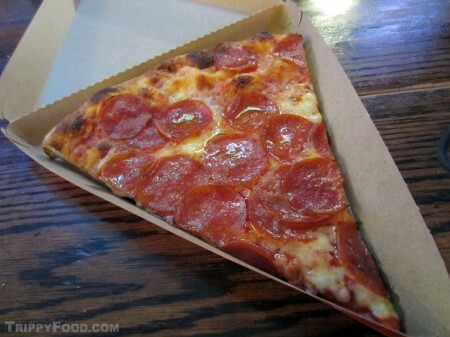 Have a slice of each! 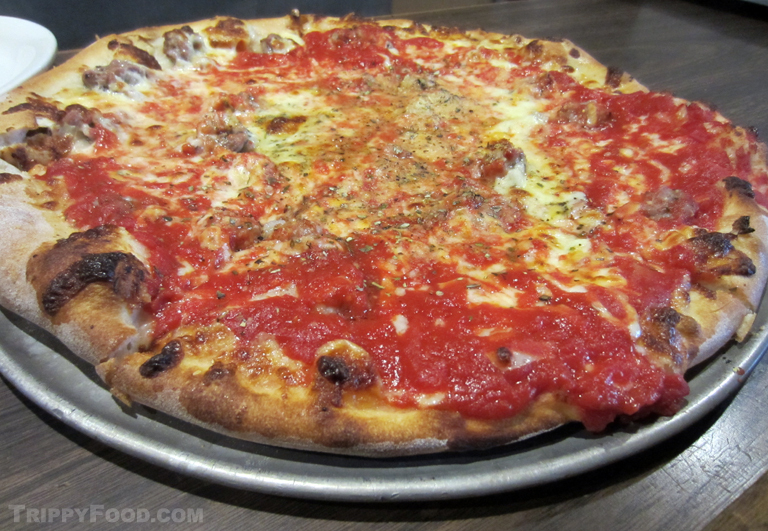 In its simplest state, Regina's pizza bears little similarity to Santarpio's - there's a satisfying tanginess from the cheese and light spice, although the thinner crust can gravitate towards flaccid - there's also an odd, flat uniformity to their pies. It doesn't detract from the taste, but Regina's pizza tends to have a bit of an oily sheen that some diners rectify with a daub of a napkin - the original location used to be famous for offering extra oil for a nominal fee. Pizza aficionados in the Northeast have harbored a little secret when it comes to pizza - the phenomenon of Greek pizza. This unique style doesn’t appear to have made its way west, but is unmistakable to New Englanders, particularly in the Boston area. Finding a Greek pizza place is easy - one need only look for the phrase "House of Pizza" in the title. Expect your House of Pizza to be a combination pizzeria and sub shop where the norm is to give your sub a little "me" time in the pizza oven in an effort to toast the roll and its contents. For the most part, Greek pizza ends up looking like it came out of a machine, most likely from being baked in a pan with a raised lip - the pi-worthy pie is perfectly circular with the smooth crust having a uniform height all the way around. There's a particular sweetness to the pizza, which could be the result of sugar in the sauce (although it seems to emanate from the golden brown crust). 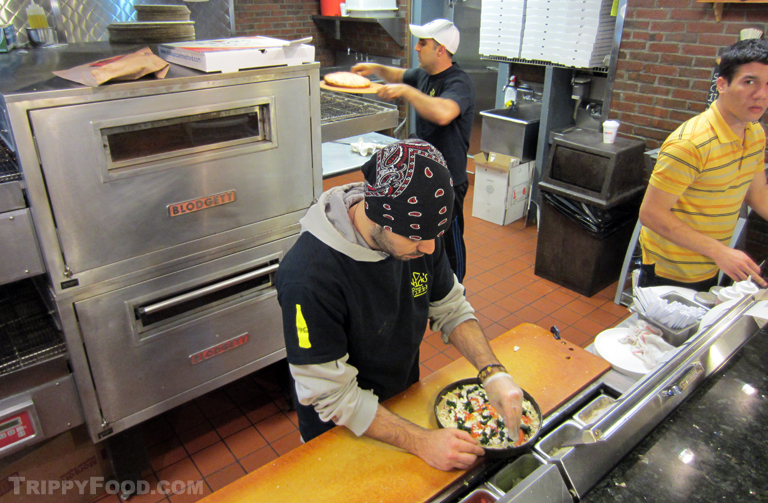 For the definitive Greek pizza, head north a few miles to Medford - located prominently to service the lunchtime crowd on the campus of Tufts University, Nick's House of Pizza has been purveying pizza to the populace since Nick Kermanidis opened his restaurant in 1988. The pizzeria has a modern, clean look to it - sleek, yet unpretentious - in the middle of the spacious kitchen (which takes up almost half of the restaurant) is a small, gleaming workhorse of a pizza oven. Instead of a front door, the pizzas are delivered to the oven's wide pie hole via a metal conveyor belt and collected on the other side. There are over 30 toppings to choose from (including the uniquely Bostonian sirloin steak tips), but when in Medford do as the Athenians do and order the Mediterranean (featuring black olives, spinach, feta cheese and slices of tomato). 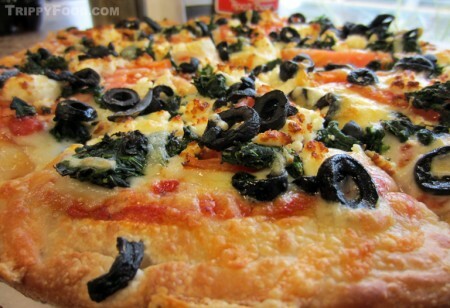 Greek pizza is pretty substantial, thicker than New York style, but at least an inch shy of deep dish; it has a tendency to be drier as well, an admirable quality when eschewing the knife and fork and trying to avoid dropping the ingredients down the front of your Oxford shirt. For those looking for something a little more upscale, dinner at Picco in the South End is in order. Rick Katz (formerly the Executive Pastry Chef at Boston institution Legal Sea Foods) opened Picco in 2004; the name is a playful acronym for Pizza and Ice Cream Company, but when it comes to making exceptional pizza and ice cream in-house, Katz means business. Part of what makes Picco's pies unique is the custom-built oven that applies a 400-degree heat on the left side to cook the pizza and a 700-degree inferno on the right to finish it. 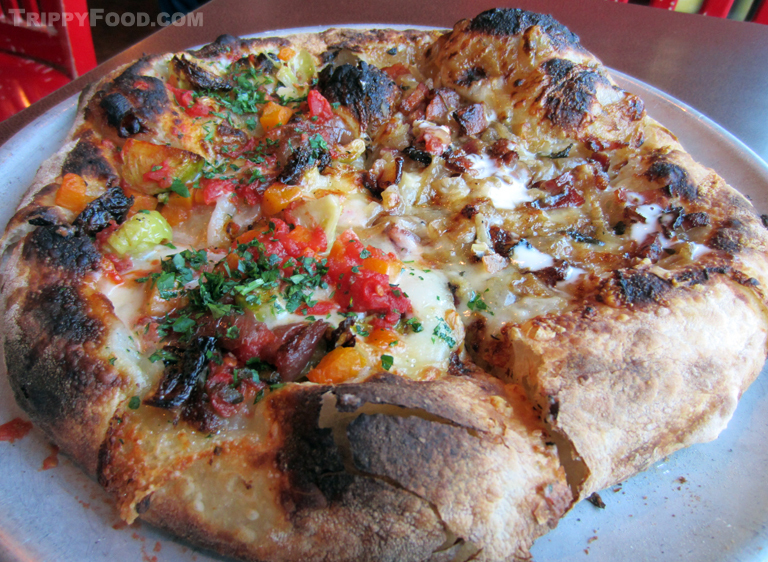 The pizzas are normally served well-done, but the wait staff will caution you that your selection may come out looking like a Vesuvius victim unless you specify otherwise (my waiter confessed that he enjoys his charred and unrecognizable as pizza). The pizza arrives with collapsed black blisters that give the crust some crunch but don't incinerate the ingredients; although the pizzas are not available by the slice, since most of the gourmet pies are around the same price, Picco will happily allow you do a half-and-half (or create your own from a variety of near-exotic ingredients). Their pride and joy and most popular selection is the French-inspired Alsatian featuring sweet, caramelized onions, shallots, garlic, crème fraiche, and crispy bits of savory bacon. The onions are cooked to where they virtually melt in your mouth and are complemented by the smooth, tangy cream and the gruyere, all cuddled atop the light, bubbly and smoky crust. Their roasted red pepper pie with goat cheese, arugula, and tomato, finished with balsamic vinaigrette, is fresh and colorful with the flavor of a hot garden sandwich. The ice cream flavors change daily and range from the tried-and-true vanilla and chocolate to the exotic guava, pumpkin and pear. In addition to other European dishes on the menu, Picco has an expansive bar with a wide variety of craft beers and an excellent wine selection as well as freshly ground and brewed coffee from international growers. This entry was posted in New England and tagged Alan Richman, Boston, Boston Magazine, cheese, Chicago, garlic, Greek, House of Pizza, ice cream, Italian, lamb, MA, Massachusetts, New York City, Nick's, Picco, pie, pissa, pizza, Polcari's, Regina Pizzeria, Rick Katz, Santarpio, Santarpio's, sausage, sausages, skewers, steak tips, Uno, Wicked. Bookmark the permalink.